Our Upper Village Leadership, Contemporary Community Citizenship (CCC) and Judicial Committee (JC) are at the core of how Nea functions as a small-scale democratic society. These learner-led and facilitator-supervised groups have impact on all aspects of Nea's school culture and academic and extracurricular life. Leadership is a vital way that Nea empowers learners. Leadership takes on many of the executive functions of the community (similar to a student council) and creates a more meaningful and valuable educational experience. Leadership meets a minimum of once a week and works closely with a facilitator to deliberate, vote on and implement proposals submitted by the community. Leadership operates according to Robert's Rules of Order to help train learners in this method of conducting business. Leadership responsibilities include planning and coordinating campus-wide activities, planning and conducting weekly CCC meetings and announcements, enforcing community rules, codifying changes in the rule book, supporting the operation of day-to-day affairs, and planning, coordinating and facilitating the annual Nea Constitutional Convention. The opportunity to plan, organize and run their own learning community encourages leaners to engage more fully, care more deeply and provides them with valuable experience in management and responsibility. Nea's democratic model helps create participatory and empowered citizens both within Nea and the larger community. Beyond providing meaningful roles and real-world experiences for learners, leadership helps maintain and operate the school more cost-effectively by mitigating the need to hire support staff to perform these functions. CCC encompasses the entire community of learners. This group meets weekly in whole-school and small group formats and serves as Nea's primary communication matrix. Learners come together to discuss ongoing issues of importance to the school – from issues as mundane as noise levels and cleanliness to issues as complex and critical as sexual harassment and community relations. Individual needs may also be discussed, if appropriate. CCC also assumes responsibility for legislative action – for making, discussing and voting on formal proposals that relate to the policy and operations of the school. This includes the creation and amendment of the Law Book – the document which clarifies the rules and code of conduct for the entire Nea community, including learners, facilitators, parents, and community visitors. Many of these actions are controlled by the CCC and do not require review or approval by the Nea Board. However, issues which reflect a change in basic mission, charter, philosophy, budget and personnel matters do require review and approval by the Nea Board before they take effect. 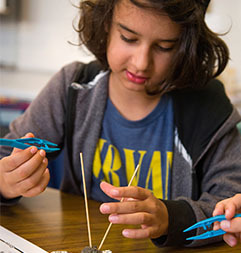 Although some actions taken in CCC may require the approval of other bodies, the bulk of the decision-making related to self-management is in the hands of Nea learners. In this way, the youth of Nea are empowered to establish the operational rules of their learning community and to make decisions about the use of certain resources (e.g., purchase of specific equipment, use of funding for field trips, etc.). CCC also evaluates our facilitators, Leadership Committee and school operations and makes recommendations for change. CCC is the locus for Nea's annual Constitutional Convention, during which the entire community reviews the operations of the year and make changes to the Constitution governing the school. The Judicial Committee (JC) is comprised of five clerks elected by the learners and one facilitator selected by his/her peers. JC meets three times each week to consider issues related to infringement of rules codified in the Law Book developed by CCC. JC enforces the rules of the school by hearing cases submitted by learners and facilitators and deciding on appropriate consequences to specific actions. The findings of the JC are binding on all parties involved and may result in further action, including suspension or expulsion, if necessary. The JC also mediates disputes and assists parties engaged in conflict to find common ground and move forward in a cooperative manner. This role is particularly important to maintain harmony among parties who remain in the same learning community and interact regularly. The JC is vital to the governance of Nea, placing the responsibility for self-management and governance directly on the learners.